It was 12 years ago when PokerStars decided to launch the weekly Sunday Million event, giving online players a chance to turn a relatively small investment into much, much more. Hundreds of millions of dollars in prize money later, PokerStars resolved to celebrate the Sunday Million’s 12th anniversary in style, guaranteeing a monstrous $10 million prize pool for just a $215 buy-in. A total of 43,975 entries were tallied and with 9,701 being re-entries, that means 34,274 players took their shot at the $1.2 million scheduled first-place prize. The 7,334 in the money benefited from an overlay of more than $1.2 million. Sunday’s play took the field down to 535 runners with Latvia’s “LV_Arturs” and Brazil’s “ViDss” leading the way. Those players returned Monday, and after another long day of online grinding, “Hulk9950” claimed the title along with $960,000 after a three-way deal. A small-stakes player from Brazil, according to the PokerStars blog, “Hulk9950” started Day 2 in 21st place with more than 60 big blinds to work with. After hovering around average chips for around five hours of play to get down to two tables, “Hulk9950” got a key double up and never really looked back from there. “Hulk9950” three-bet shoved with ace-queen from the small blind, only to have “FrCnnctn1960” re-shove from the big blind with pocket kings. Tournament life on the line, “Hulk9950” found an ace on the flop and another on the river to stay alive and briefly take over the chip lead. “Hulk9950” regained that chip lead on the final table bubble and then picked up pocket tens on the button, facing an under-the-gun all-in shove from “jeffzhang888” who held ace-jack. Hulk re-raised to isolate and then eliminated the bubble when the board ran out clean. And the final table was set with the following chip distribution and blinds at 3M/6M/750K. “Hulk9950” extended the lead after defending the big blind against a 1.3 million chip-raise from “kiwis1966” two hands in. The pair checked flop and then “Hulk9950” check-called a bet of 14.6 million on the turn. Hulk checked the river, only to move all in after a bet of 22.9 million from kiwis, putting the latter to a decision for 101 million more chips. “kiwis1966” folded king-queen face-up and the big pot went to “Hulk9950”. Six hands later, “oddscompile” three-bet shoved all in with ace-jack in the hijack for an additional 17 million after a 13.2 million raise from “moutsoun75” in middle position with . After making the call, “moutsoun75” flopped the nuts when three clubs appeared on the board, and that was it for the Romanian player. Next out was past Sunday Million finalist “botteonpoker” in eighth after jamming with ace-jack over an open min-raise from “Hulk9950”, who called with the superior ace-queen and held. Shortly after, a large three-way pot started with a 38.4 million-chip raise from “FrCnnctn1960” with ace-jack suited. The most accomplished player at the final, “Sasuke234”, moved in for 51.5 million with pocket kings and “zelikzelik8” called with ace-queen suited in the big blind. “Sasuke234” tripled up after flopping top set and holding, while “FrCnnctn1960” took seventh place. “zelikzelik8” was left with 106 million after the three-way clash, and got it in shortly thereafter, raising nearly all in with king-jack and getting the rest in on a four-high flop. It was “Hulk9950” doing the dirty work again, calling down with ace-eight to send the sixth-place finisher to the rail. Then, “Sasuke234” claimed another knockout after open-shoving with ace-nine suited on the button and getting called by “kiwis1966” in the small blind with pocket queens and the shorter stack. The ace-high flop sprung “Sasuke234” into the lead and “kiwis1966” was unable to catch up, exiting in fifth place. A few hands later, “moutsoun75” moved all in for 69.9 million on the button. After “Sasuke234” flat-called in the small blind with pocket eights, Big Blind “kapchin” re-shoved for 274 million and “Sasuke234” got out of the way. A paired flop and a nine on the river improved “kapchin” to nines-full and “moutsoun75” was the fourth-place finisher. With three left, a deal was made that saw each player lock up at least $640,000, leaving $200,000 additional for the eventual winner. Four hands later, “Hulk9950” limped in for 8 million in the small blind with ace-deuce and “Sasuke234” made it 24 million with pocket eights. That was met by an all-in shove, and “Sasuke234” called for 202 million chips with the best hand, only to see an ace on the flop end his bid for the title. The heads-up match between “Hulk9950” (710 million chips) and “kapchin” (389 million) lasted longer than it took to get from nine down to two, which was only 45 minutes. “kapchin” put up a strong fight, taking over the lead at one point, but eventually losing it back to “Hulk9950”, who then maintained around a two-to-one chip advantage over “kapchin” for a long stretch. Then, “kapchin” limped in on the button with seven-eight and called a raise from “Hulk9950” who had pocket kings. “kapchin” made a pair of eights on the jack-high flop and shoved 178 million after “Hulk9950” led out. “Hulk9950” called, and after a safe turn, a seven landed on the river to give “kapchin” two pair and stay alive. The tides seemed to be turning in favor of “kapchin”, but “Hulk9950” went on to win 17 of the next 22 hands, including a 219 million chip-pot where “Hulk9950” defended the big blind with queen-six suited and check-called all three streets, showing down two pair, which was good against the ace-king suited of “kapchin”. Whittled down to around ten big blinds, “kapchin” shoved with queen-ten and “Hulk9950” called with ace-three. The king-high flop also contained a three, giving “Hulk9950” bottom pair, and that would prove plenty good to win the pot and close out the tournament for what is sure to be a life-changing victory for the Brazilian. 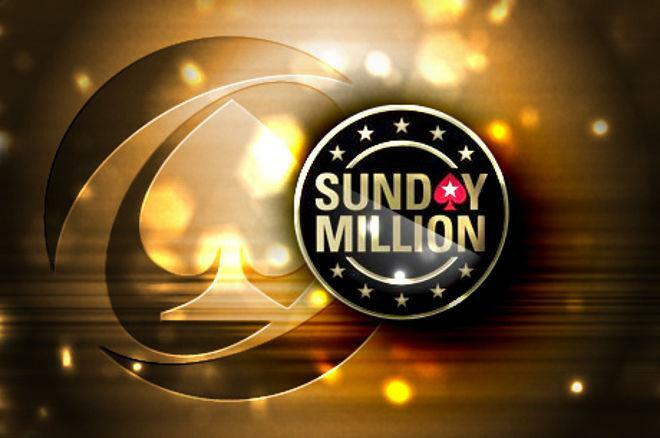 $10 Million Guaranteed Sunday Million at PokerStars on Feb. 4.